Vintage Christmas jewelry collectors all know - Costume Jewelry Christmas Tree pins are the ultimate Christmas Jewelry prize! In the Art Modern period ( 1945-1960) jewelry manufacturers started designing more traditional costume jewelry; characteristic of this brief period is Rhinestone Costume Jewelry, poodle pins, Christmas-themed costume jewelry and the Costume Jewelry Christmas Tree pin was the glittering star. Costume Jewelry was an affordable way to spruce up an old outfit or add a touch of glamour. Before this time, in the 1930s inexpensive glass pendants, brooches, bracelets and other pieces of Antique Costume Jewelry were added to the contents of foil-wrapped Christmas Crackers. For all things costume figural jewelry it's hard to beat this book. A good reference for Costume Jewelry Collectors and a must-read for christmas tree pin collectors. Before the 1940s , women might wear a Christmas tree corsage on the lapel of their winter coats, but noone christmas tree pin, has been referenced, as far as I'm aware in the History of Jewelry before the Art Modern Period. If you have a reference, before this date, for the love of jewelry, please Contact and let me know. The Christmas tree corsage was made from foil leaves, colorful ribbons, beads and plastic decorations, the corsages were fragile and required replacement every year. The Christmas theme corsage was gradually replaced with the introduction of more durable costume jewelry. "As a dealer, I often come across vintage corsages. Many have never been worn and are still in their original box, which of course increases the value". OK. I'm hooked. What next? Where can I find Christmas Jewelry? Because of the demand for Christmas Tree Jewelry and the lack of information about this style of costume jewelry, and hard-to-find Christmas Tree JEWELRY, I've created the Christmas Jewelry Trading On-Line Forum. You do not have to Subscribe to our Newsletter to participate. Christmas Costume Jewelry, is Very collectible today, and is priced anywhere from a few dollars to a few hundred dollars, depending on the age, condition, rarity, designer and style of the Jewelry. However, the Value of your Christmas Jewelry can only be determined by a professional online appraiser and is based on the information submitted. Need a Professional Valuation through Antique Jewelry Investor? The Jewelry Appraisal Form can be found HERE! Unlike its predecessor the corsage, Christmas jewelry is in demand year round. While the Christmas tree is the most popular type of brooch, jewelry collectors also search for the many other themes available, including snowmen, ornaments, candy canes, Santa Claus, sleighs, bells, wreaths, angels, candles and animal figurais, such as reindeer. Collectors of Christmas pins are always on the prowl for something different to add to their collection, with signed pieces leading demand over unsigned ones. There are also collectors who specialize within a theme, wanting only rhinestone trees or trees featuring candles or dangling bead ornaments. Still others are have a passion for acquiring every costume jewelry Christmas tree pin a particular designer has ever made. Kathy Flood has been a dedicated costume jewelry Christmas tree pin collector since the early '90s. Her on-line store, The Jeweled Forest (www.Christmas treepins.com) opened in August 2000 and is the only one almost exclusively devoted to Christmas tree pins. "Every serious collector desires and then requires a Weiss geometric candle tree and the Weiss tree is probably the most expensive 'common' pin," Kathy said. "Although the six-candle pin is relatively easy to find, it can sell for up to $150". The Weiss line-up of Christmas Jewelry includes geometric candle tree pins with three or five candles, with the Three-Candle Pin being the most difficult to find. Weiss also produced matching screwback and clip-on earrings. Kathy warns collectors to be very careful when purchasing signed vintage Christmas jewelry. "Some unscrupulous vendors are buying raw, unfinished and unplated castings with the Weiss name on them, then popping in vintage stones and charging $100-$200. There are also reproductions of designs by Kirk's Folly, Hobe and Hollycraft, especially the Hollycraft tree with dangling faceted beads." Vintage jewelry is also the inspiration behind many contemporary artisans, including Sheryl Hamilton, owner of the Family Jools who designs unique handcrafted fashion jewelry; Sheryl's work is heavily influenced by the Victorian and Art Deco eras and early Czechoslovakian jewelry. Sheryl's Christmas creations feature vintage rhine-stones as well as old brass stampings and unique beads, recycled from vintage jewelry broken beyond reasonable repair, that doesn't cost the earth...Rachel Dow of Desert Bloom Studios (www. eclecticbeadery.com/desertbloom.html) incorporates vintage glass beads and flowers into her jewelry designs. "To me, historical research is an important part of the design process." Rachel draws inspiration from the works of famous designers and artistic creations from Czechoslovakia, Italy, Germany and Japan. Many of my Christmas designs were motivated by the Miriam Haskell parure, a matching set of three or more pieces so popular in the 1950s. Christmas time, that festive time of year when we bring out the good china, dress in our holiday finery and spend countless hours looking for that perfect gift and that very coveted costume jewelry christmas tree pin or brooch. Whether your passion is collecting, decorating, entertaining or making homemade treasures, the possibilities are endless when it comes to celebrating Christmas with costume christmas jewelry, brooches and nostalgia. 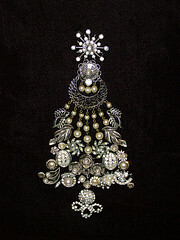 And as far as the collectors are concerned, Costume Jewelry Christmas Tree is the icing on the Christmas cake!